Johnson, R.I. & A.H. Clarke. 1983. 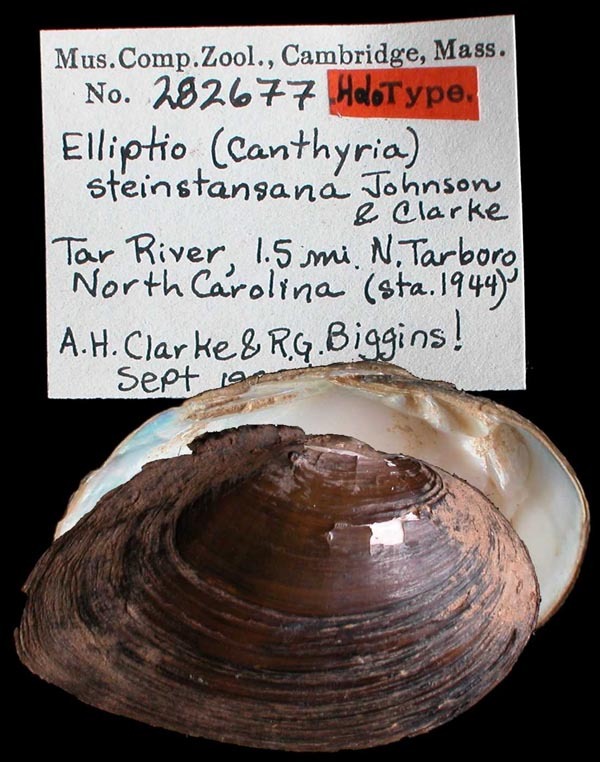 A new spiny mussel, Elliptio (Canthyria) steinstansa (Bivalvia: Unionidae), from the Tar River, North Carolina. Occasional Papers on Mollusks 4(61): 289-298. Elliptio (Canthyria) steinstansana Johnson & Clarke, 1983. Johnson & Clarke, 1983, Occ. Pap. Moll. : 291pl. 40, figs. 4-5. Type(s): HOLOTYPE (ORIG. DESIG.) MCZ_282677, Tar River, 1.5 mi N. Tarboro, North Carolina. Elliptio (Canthyria) spinosus (Lea). — Johnson & Clarke (1983: 290). Elliptio (Canthyria) steinstansana new species. — Johnson & Clarke (1983: 291). Fusconaia collina (Conrad). — Johnson & Clarke (1983: 289). Fusconaia masoni (Conrad). — Johnson & Clarke (1983: 289).